Basingstoke has retained its Purple Flag accreditation for the seventh year running which is testament to efforts made to keeping the town a safe, entertaining and enjoyable place to spend an evening. 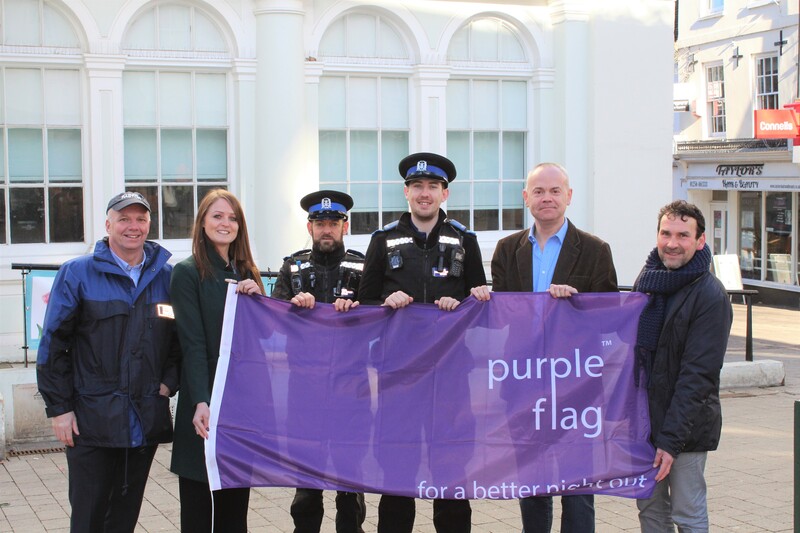 Basingstoke’s Purple Flag celebrates the town’s diverse number of venues for different ages, groups, lifestyles and cultures, its crime reduction and prevention measures and the ease and availability of nighttime transport links. Basingstoke’s accreditation has been spearheaded by a number of authorities including Basingstoke Together, Basingstoke and Deane Borough Council and Basingstoke Town Centre Pubwatch. Basingstoke Together is the face of the Basingstoke Business Improvement District (BID). The BID’s aim is to help Basingstoke town centre to thrive by creating destination events, engaging with consumers and supporting retailers and businesses. Lucy Boazman, Chief Executive of Basingstoke Together, said: “We are so pleased that Basingstoke has once again held onto its Purple Flag accreditation. A huge number of organisations and authorities work so hard to keep the town friendly, fun and safe for people from all walks of life in Basingstoke. So, this accreditation shows that we are successful in doing so. The Purple Flag initiative is run by the Association of Town Centre Management. It operates in a similar way as the familiar Green Flag scheme for parks and Blue Flags for beaches. The aim is to raise the standard and broaden the appeal of town centres throughout the UK as evening or late night venues to support thriving local economies. Basingstoke is one of 70 towns throughout the UK to have this accreditation having first secured recognition in 2013 and has held onto it ever since. The Purple Flag committee commended Basingstoke’s diverse calendar of events including Basingstoke Festival, the Exit 6 Film Festival and Independent Business Month. It also positively rated the independent venues in the town including Flip Out, Duck and Tipple and the Escape Rooms to cater for a wide age range. It also considered efforts made to keep Basingstoke safe including anti-social behaviour measures and in light of the terrorist attacks across the UK in recent years. Find out more about the Purple Flag accreditation here or find out more about Basingstoke Together here.